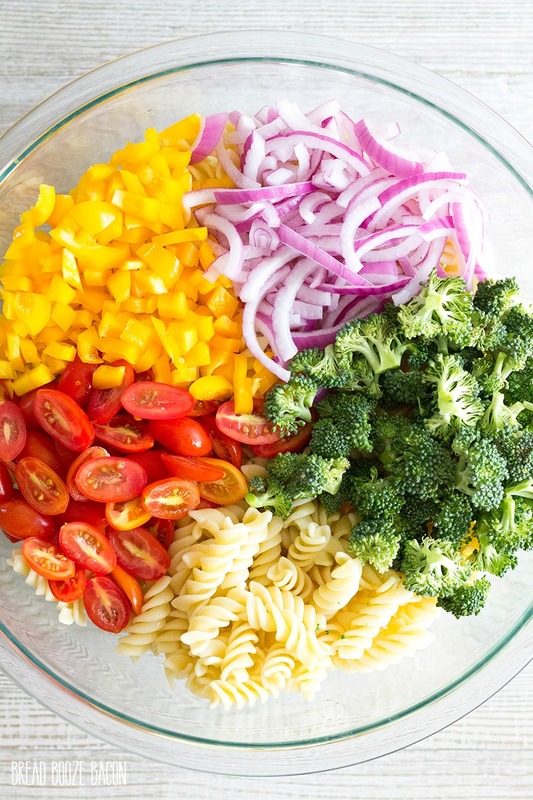 This Vegetable Pasta Salad Recipe is an easy summer side dish you can customize with your favorite veggies! My family’s get togethers are potluck style nine times out of ten. We each pick a course or two and bring something to my mom’s house for lunch or dinner. It keeps one person from having to do all the cooking (and dishes) and you get to try these amazing recipes you hadn’t thought of trying. 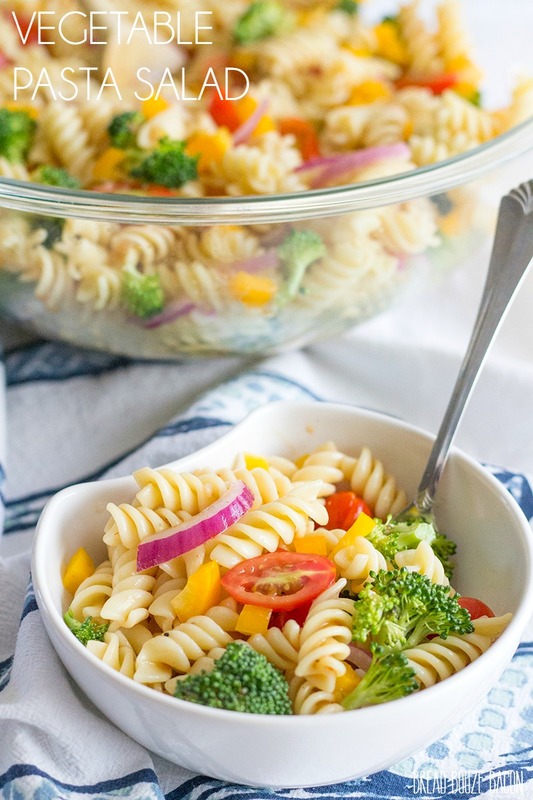 During the summer months, there’s always and easy pasta salad recipe on the table and it’s usually one of the first things to go. We usually rotate who gets to bring the pasta salad, but some days we luck out and get two. We’re into carbs like that. 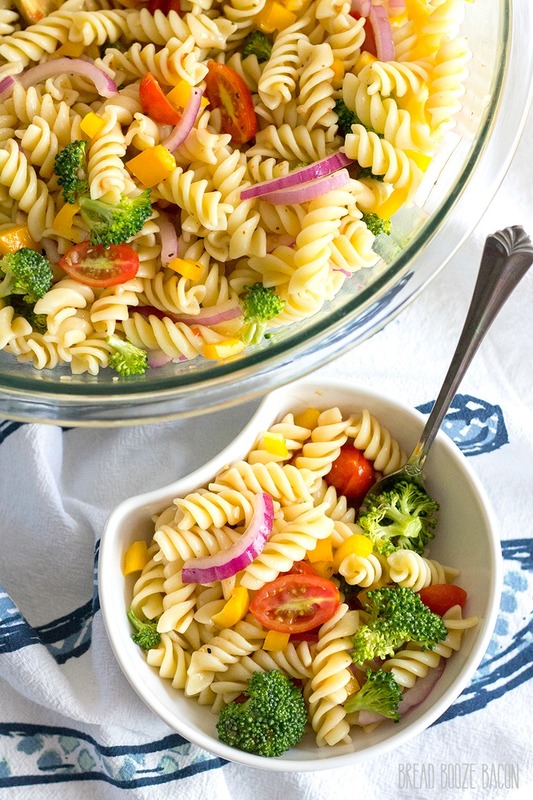 This Vegetable Pasta Salad Recipe is perfect for outdoor barbecues and cookouts. There’s no mayo and all the fresh flavors will brighten any meal. There are two things I really love about this recipe. One, all the colors! You can substitute or add your favorite veggies to your tastes. It’s all about a gorgeous dish that’s good for you. Two, you can make this recipe ahead of time and it travels well. Those two things alone are the makings for a perfect potluck dish. For dressing this salad you have a couple options. You can use your own homemade Italian dressing if you have a favorite, or grab a bottom of dressing from the store. You do you. Simple and easy is my jam some days. I used a roasted red pepper Italian dressing for this recipe and it was amazing! If you can’t find that type a regular zesty Italian, balsamic vinaigrette, or sundried tomato vinaigrette would all be great too. It’s all about making a dish you love and that suits your tastes. Bring a large pot of water to a boil. Cook the pasta according to package directions until al dente. Drain the pasta and then rinse under cool water. 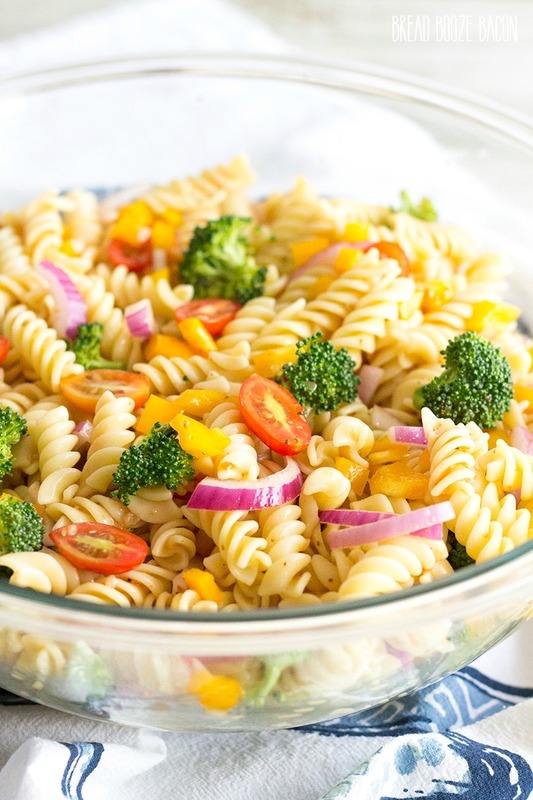 Transfer the pasta to a large serving bowl and toss with vegetable oil to prevent sticking while you prepare the veggies. Cut each tomato in half lengthwise and add on top of the pasta. Core and seed the bell pepper. Dice the pepper and add it to the pasta bowl. Remove the skin from the onion, cut the onion almost in half (so there are 2 quarter pieces that touch at the root), and then thinly slice the onion. Rinse the onion under cold water and separate into strips. Dry with a paper towel and add to the pasta bowl. Remove the stem from your broccoli and then cut the tops into small, bite-sized pieces. Add to the pasta bowl. Pour the Italian dressing over the vegetables and pasta. Use a wooden spoon to gently toss everything together until well coated in the dressing. Season with salt and pepper to taste, if desired. 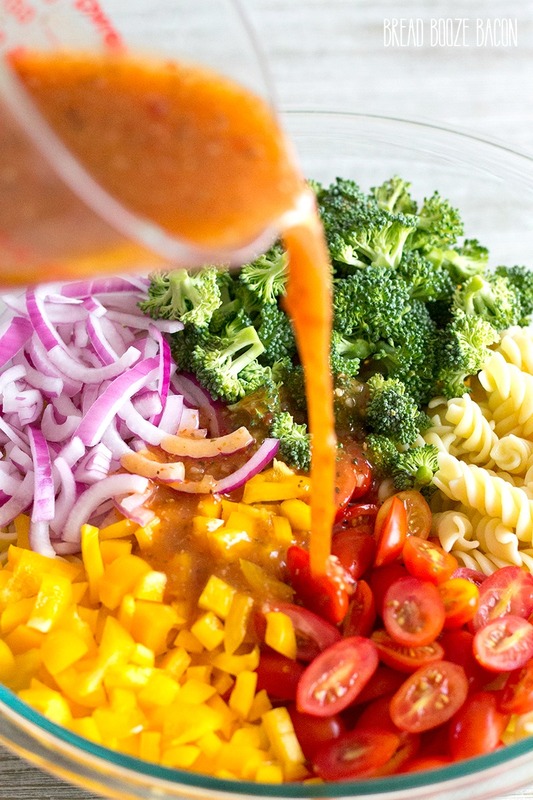 You can substitute your favorite Italian dressing in this recipe as well. I loved the flavor from the roasted red pepper dressing I used, but my homemade dressing is delicious in this recipe too.